Some colleagues and I are presenting a poster at the Centre for Health Services & Policy Research conference on March 7-8, 2019. Rather than cluttering up our poster with a reference list, we are putting our references online here and our poster will have a QR code linked to this page. So if you’ve come looking for the references from our poster, you’ve come to the right place! Benjamin, A. (2008). Audit: how to do it in practice. BMJ: British Medical Journal, 336(7655), 1241. Cook, P. F., & Lowe, N. K. (2012). Differentiating the Scientific Endeavors of Research, Program Evaluation, and Quality Improvement Studies. Journal of obstetric, gynecologic, and neonatal nursing, 41(1), 1-3. Hedges, C. (2009). Pulling It All Together: QI, EBP, and Research. Nursing management. Nursing management, 40(4), 10-12. Naidoo, N. (2011). What is Research? A Conceptual Understanding. African Journal of Emergency Medicine, 1(1), 47-48. Newhouse, R. P., Pettit, J. C., Poe, S., & Rocco, L. (2006). 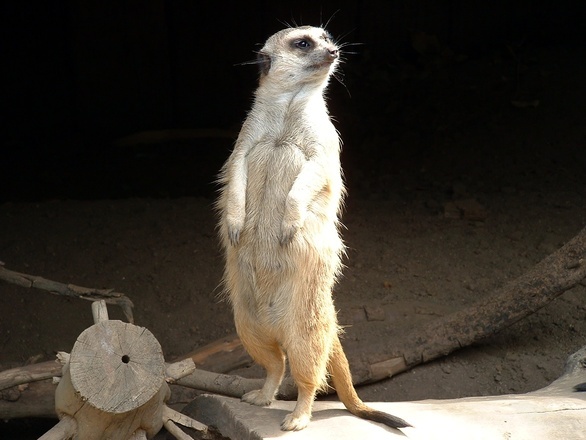 The Slippery Slope: Differentiating between Quality Improvement and Research. Journal of Nursing Administration, 36(4), 211-219. The Canadian Evaluation Society’s national conference was held right here in Vancouver last month! I was one of the program co-chairs for the conference and I have to say that it was pretty awesome to see a year and a half worth’s of work by the organizing committee come to fruition! 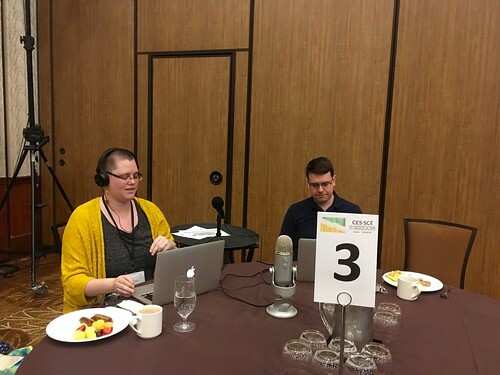 There were a lot of people involved in putting together the conference and so many more parts to it than I had realized when I started working on it and it was incredible to see everything work so smoothly! As I usually do at conferences, I took a tonne of notes, but for this blog posting I’m going to summarize some of my insights, by topic (in alphabetical order) rather than by session 1Though I’ve listed all the sessions I attended at the bottom of this posting. as I went to some different sessions that covered similar things. Where possible, I’ve included the names of people who said the brilliant things that I took note of, because I think it is important to give credit where credit is due, but I apologize in advance if my paraphrasing of what people said is not as elegant as the way that people actually said them. Damien Contandriopoulos noted that context is often defined by what it is not – it is not your intervention – i.e., it’s whatever is outside your intervention, but it’s not the entire universe outside of your intervention. Just what is close enough to be relevant/important to the analysis. He also noted that some disciplines don’t talk about context at all (e.g., they might talk about the culture in which an intervention occurs, but don’t talk about it as separate from the intervention the way we talk about context as being separate from the intervention). neutralize the context (e.g., those who think that context “gets in the way” and thus they try to measure it and neutralize it so it won’t “interfere” with your results). Contandriopoulos clearly didn’t favour this approach, but noted that it could work if your evaluand was very concrete/clear. considering: how do we know if the support factors are necessary or sufficient? What if you need a combination of factors that need to be present at the same time and in certain amounts for the program to work? etc. Kas Aruskevich showed an imagine of a river in Alaska viewed from above and noted that if you were standing by the side of that river, you’d never know what the sources of that river are (as they are blocked by mountains) and she likened evaluation to taking that perspective from a distance where you look at the whole picture. I liked this analogy. Kathy Robrigado talked about how the accountability function of evaluation is often seen as an antagonist to learning, but she sees it as a jumping off point for learning. In summarizing the Leading Edge panel, E. Jane Davidson had a few things to say that were very insightful in relation to thinking I’ve been doing lately with my team about what evaluation is (and how it compares/relates to other disciplines that aim to assess program/projects/etc.). With respect to monitoring, she noted that people often expect key performance indicators (KPIs) to be an answer, but they aren’t. Often what’s the easiest to measure is not what’s most important. In evaluation, we need to think about what’s most important (not just what’s strong or weak, but what really matters). Lyn Shulha noted that as an evaluator, you’ll never have the same context/working conditions from one evaluation to the next, and you’ll never have a “final” practice or theory – they will continue to change. Kylie Hutchison talked about how many evaluators are talking about the evaluator as a social change agent. People gravitate to this profession because they want to be involved in social change – maybe they are a data geek, but they see how the data can lead to social change. 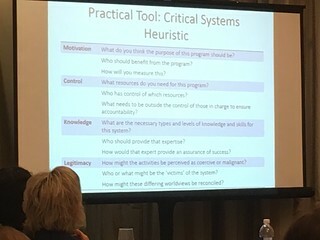 She also talked about how many skills she has needed to build to support her evaluation practice: in grad school she focused on methods and statistics, but when she went on to become a consultant she didn’t find that she needed advanced statistics – she needed skills in facilitation, then data visualization, and now organizational development. Kim van der Woerd described getting knowledge into action as “the long journey from the head to the heart”. I really like this phrase, as just knowing something (with the head) doesn’t necessarily mean we take it to heart and put it into action. I wonder how thinking about how we can get things from the head to the heart could help us think about better ways to promote the translation of knowledge into action. Lyn Shulha talked about learning spirals – as we travel from novice to expert, we can imagine ourselves descending down, say, a spiral staircase. As a given point, we can be at the same place as earlier, but deeper (as well, we are changed from when we were last at this point). She noted that we “need to hold onto our experiences and our truths lightly”, lest we end up traveling linearly rather than in a spiral. calling the first version of the logic model “strawman #1” to emphasize that the logic model is meant to be challenging and changed. E. Jane Davidson noted that in social sciences, people are often taught how to break things down, but not how to pack it back together again to answer the big picture question. For example, you’ll often see people report the quantitative results, then the qualitative results, but with no actual mixing of the data (so it’s not really “mixed methods” – it’s more just “both methods”). Also from E. Jane Davidson – the length of a section of a report is typically proportional to how long it took you to do the work (which is why literature reviews are so long), but that’s not what’s most useful to the reader. It’s like we feel we have to put the reader through the same pain we went through to do the work; we want them to know we did so much work! And then they get to the end and we say “the results may or may not be…. and more research is needed.” Not helpful! Spoilers really are key in evaluation reporting – write it like a headline. Pique their interest in the spoiler and then they want to read the evidence (how did they decide that?? and make sure your recommendations are actionable! 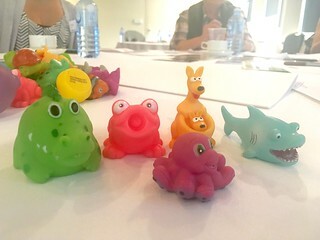 The Leading Edge Panel on Rubrics was easily my favourite session of the conference. I’ve done a bit of reading about rubrics after going to a session on them at the Australasian Evaluation Society conference in Perth, but found that this panel really brought the ideas to life for me. You should be able to see your theory of change in the rubric. Key evaluation questions (KEQ) often follow the theory of change (e.g., KEQs might be “how well are we implementing?” or “how well are we achieving outcome #1?” Think about the causal links in the theory of change. If there is a deal breaker, it should show up in the theory of change.). Think about the causal links and their strength. Make sure that the data collection is designed to answer the evaluation questions. Look to see if you are getting consistent information (i.e., saturation) or if the data is patchy or inconsistent and you need to get more clarity. When you think about the exceptions or contradictions – how big of a deal are they? Are they deal breakers? As stakeholders do this, they start to understand the data and to own the evaluation. Often they make harder judgments than the evaluator might have. Typically, they do the synthesis and bring that to the stakeholders to do sensemaking; but don’t spend a lot of time making the synthesized data looked polished/finished – it should look rough as it is to be worked with. Not everyone will spend time reading the data synthesis in advance, so give them time to do that at the start of the session. Put up the rubric and have the stakeholders grade the program. Often people try to do analysis, synthesis, and sensemaking all at the same time, but you should do them separately. Rubrics “aren’t just a method – they change the whole fabric of your evaluation”. They can help you “mix” methods (rather than just doing “both”) methods – they can help you make sense of the “constellation of evidence”). I asked how do they deal with situations that are dynamic? Their answer was the rubrics can evolve, especially with an innovative program. You create it based on what you imagine the outcome will be, but other things can emerge from the program. You can start with a high level rubric (don’t want to get too detailed or overspecified that you paint yourself into a corner). You need it to be underspecified enough to be able to contextualize it to the setting. It’s like the concept of “implementation fidelity” – implementing something exactly as specific is not the best – you should be implementing enough of the intent in a way that will work in the setting. Another audience member asked about “scaling up” rubrics. 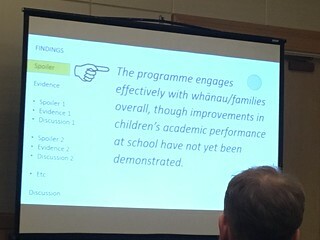 The speakers noted examples where they had worked on projects to create rubrics to be used across a broader group than those who created it – e.g., created by the Ministry of Education to be used by many different schools with the help of a facilitator. For these, you need to have a lot more detail/instructions on how to use it (and a good facilitator) since users won’t have the shared understanding that comes from having created it. They have also done “skinny rubrics” to be used by lots of different types of schools (so had to be underspecified), but again, need to provide lots of support to users. Systems archetypes are common patterns that emerge in systems. This was a concept that was brought up by an audience member in my session on complexity, and is something I want to read more about! multiple perspectives – what are the world views being applied and what the implications of those world views? She suggested you can do a stakeholder analysis, but also a stake analysis; she also suggested “framing” by using an idea from Bob Williams, where you add the words “something to do with…” in front of ideas (e.g., “Something to do with a culture of health”, “something to do with managing heart disease”; this tool can help give you a sense of the intervention’s purpose and the evaluation’s purpose. Last year, the CES took a position on reconciliation in Canada. Several of the speakers at the conference talked about this topic. For example, Kim van der Woerd talked about a witness as being one who listens with their whole heart and validates a message by sharing it (and that they have a responsibility to share it). She also noted that the Truth and Reconciliation Commission (TRC) wasn’t Canada’s first attempt at trying to build a good relationship between Aboriginal and non-Aboriginal people – the Royal Commission on Aboriginal People put out a report with recommendations in 1996. But when it was evaluated in 2006, Canada received a failing grade with 76% of the 400+ recommendations being not done and with no significant process. She noted that we shouldn’t wait 10 years before we evaluate how well Canada is doing on the TRC recommendations. At the start of her closing keynote, Kylie Hutchison acknowledge that she was speaking on the unceded traditional territory of the Musqueam, Squamish, and Tsleil-Waututh First Nations. And then she said that she’d never said that before speaking before but that she would be now. And I thought that it was a really cool think to witness someone learning something new and putting it into practice like that, especially something so meaningful. 1. ↑ Though I’ve listed all the sessions I attended at the bottom of this posting. 2. ↑ She didn’t say the name of the paper or the journal, but based on her comments about the paper, I believe it is likely this paper. Unfortunately, it’s behind a paywall, so I can’t read more than the abstract. Been doing some reading as I work on developing an evaluation plan for a complex program that will be implemented at many sites. Here are some notes from a few papers that I’ve read – I think if anything links these three together, it is the notion of the need to be flexible when designing an evaluation – but you also need to think about how you’ll maintain the rigour of your work. Wandersman et al (2016)’s paper on using an evaluation approach called “Getting to Outcomes (GTO)” discussed the notion that just because an intervention has been shown to be effective in one setting does not necessarily mean it will work in other settings. While I wasn’t interesting in the GTO approach per se, I found their introduction insightful. That sound a lot like DE to me. And it sounds a lot like how I’m looking to approach the evaluation I’m currently planning. 1. Gather data to describe the types of changes made by healthcare organizations, how changes are implemented, and the evolution of the change process. To establish initial conditions for implementing innovations at each site and to describe implementation changes over time. 2. Collect process and outcome data that are relevant to healthcare organizations and to the research team To engage healthcare organizations in research and in continuous learning and quality improvement. 3. Assess multi-level contextual factors that affect implementation, process, outcome, and transportability. Contextual factors influence quality improvement: need to evaluate conditions under which innovations may or may not result in anticipated outcomes. 4. Assist healthcare organizations in applying data to monitor the change process and make further improvements. To facilitate continuous quality improvement and to stimulate learning within and across organizations. qualitative data analysis was conducted first within a given site (e.g., “to identify factors that hindered or facilitated implementation while also paying attention to the role contextual influences played” (p. 7 of 11), then across sites. Brainard & Hunter conducted a scoping review with the question “Do complexity-informed health interventions work?” What they found was that although “the lens of complexity theory is widely advocated to improve health care delivery,” there’s not much in the literature to support the idea that using a complexity lens to design an intervention makes the intervention more effective. “Large number of elements, known and unknown. 1. ↑ i.e., how do you know results aren’t do to other events that are occurring concurrently with the intervention? 2. ↑ i.e., how do you know the results aren’t just due to naturally occurring changes over time rather than being due to the intervention? Another posting that was languishing in my drafts folder. Not sure why I didn’t published it when I wrote it, but here it is now! “Much of human learning relies wisely on effective approaches to problem solving, learning, growth, and development that are different from the types of formal science […and …] some of those approaches offer good defences against misinterpretation, bias, and confounding.” (p. 315). I also came across this article in Forbes magazine: Why We Need Pragmatic Science, and Why the Alternatives are Dead-Ends. It’s a short read, but it succinctly summarizes an argument I find myself often making: science is a powerful tool for understanding and explaining the world. It’s not the only tool (philosophy and the other humanities, for example, are great tools for different purposes), but it’s certainly the best one for certain purposes and it’s a fantastic one to have in our toolbox! Thorpe, K.E., Zwarenstein, M., Oxman, A.D., Treweek, D., Furberg, C.D., Altman, D.G., Thus, S., Bergel, E., Harvey, I Magid, M.J., & Chalkidou, K. (2009). A pragmatic-explanatory continuum indicator summary (PRECIS): a tool to help trial designers. Canadian Medical Association Journal. 180(10): E47-E57. Evaluation is “the handmaiden of programs” (Owen) – what really matters is the effective delivery of programs/policies/strategies. Evaluation being involved on the front-end has the most potential to help that happen. Practice is about actually doing something vs. theory, which is about having “coherent general propositions used as principles of explanation for a class of phenomena or a particular concept of something to be done or of the method of doing it; a system of rules or principles” (Owen). Praxis: “the act of engaging, applying, and reflecting upon ideas, between the theoretical and the practical; the synthesis of theory and practice without presuming the primacy of either” (Owen). ET is a form of higher order thinking: making judgments based on evidence, asking good questions, suspending judgment in the absence of sufficient evidence, etc. “If I know why I believe X, I’m relatively free to change my belief, but if all I know is “X is true”, then I can’t easily change my mind even in the face of discomfirming evidence” (Duncan Rintoul). 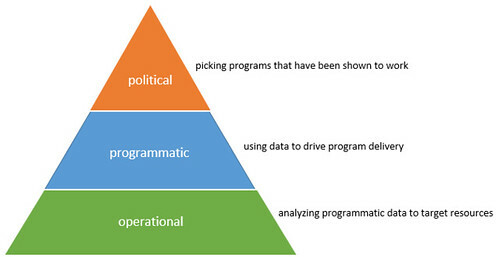 implementation is the key process variable, not adoption [where they used “adoption” to mean “choosing the program”. My experience is that this is not how the word “adoption” is always used 1E.g., while Owen used “adoption” to refer to the “adoption” (or choosing) of a program to implement, I’ve seen others use “adoption” to refer to individuals (e.g., to what extend individuals “adopt” (or enact) the part of their program they are intended to enact). why do people not include context sensitivity in complex intervention design? people often overstate the certainty of the evidence they collect – e.g., even if a study conclusion is that a program played a causal role in the place/time they was conducted, will it play a wide enough casual role that we can predict it will play a causal role in another time/place (which is what “evidence-based” policy is doing when it takes conclusions from a study/studies as evidence that the program should be applied elsewhere)? 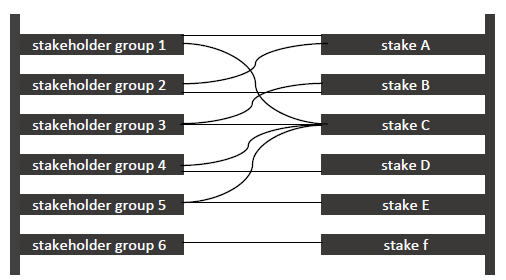 why don’t people include context-sensitivity in complex intervention design? there are profound differences between program designers and users/implementers of the program – evaluators can be a “translator” between the two. did the program reach its intended population? what changes in status, attitudes, skills, behaviours, etc. resulted from the intervention? There are many similarities between Australia and Canada with respect to Aboriginal people: a history of colonization, systematic discrimination, and ongoing oppression; A history of an imposition of “solutions” on community via programs, service delivery models, and evaluation methods; these are imposed by privileged white voices and they often harm Aboriginal communities and people rather than helping. System = elements + links between the elements + boundary. Without the links between the elements, it’s just a collection. Boundaries can be physical, political, financial, etc. They may also be contested (not everyone may agree as to what the boundaries of a given system are). Determining the boundaries = deciding what’s in, what’s out, and what’s considered important; it’s an ethical, moral, and political decision. A program always has a mental model (someone believes there is problem and the program is a way to solve it), even if they haven’t articulated it. As an evaluator, look for leverage points the program is using. Are they working? Could their be better ones? Complex systems are unpredictable (the program can have hoped-for or intended outcomes, but can’t necessarily predict things with any certainty). 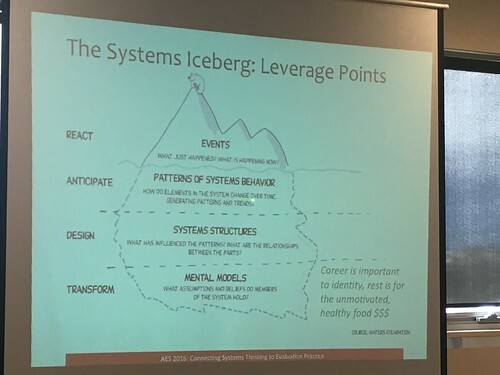 The Systems Iceberg: Mental Models (what is the problem and how do we think we can solve it? 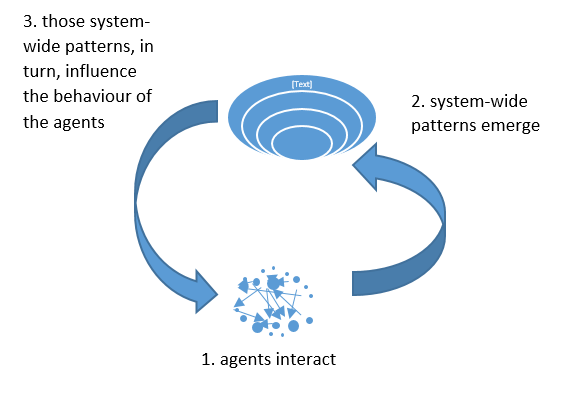 ), whether explicit or implicit, cause us to design structures, that in turn influence patterns of systems behaviour, which lead to events, which are what we tend to observe. e.g., you get a cold (event), because you haven’t been eating or sleeping well (behaviour), due to poor access to nutritious food and work stress (structures), work stress affects you because your career is important to your identity (so a threat to your career threatens your identity) and you believe resting = laziness. When you are evaluating a system, start at the top: what events happened? what patterns of behaviour led to those events? what structures lead to those patterns? what mental models/assumptions lead to those structure being developed in the first place. If you are designing a program, start at the bottom and work up! (Make your mental models explicit so you can make your design more intentional). observations and interviews are good way to get to patterns of behaviour and events. Think of the above diagram as more of a spiral than a circle. Wicked Problem truly resist a solution and every intervention into the wicked problem has an effect (so you can’t just pilot an intervention like you would for a normal problem, as the pilot itself will change the situation so doing that intervention again may not have the same effect as the starting point would be different; plus, the effect of the next intervention will be affected by the effect of the prior intervention; examples include: poverty, obesity epidemic, climate change, education (e.g. what do children need to know in the 21st century and how do we teach it to them?) – wicked problems interact with each other and that makes things even more complex (e.g., effects of climate change on those in poverty). e.g., framing effect: how you frame data affects how people react to it. E.g., if people are told a procedure has a 90% survival rate they are more likely to agree to it than if you say it has a 10% mortality rate. Thus, even though these mean the same thing, the way it’s framed affects the decision people make based on the evidence. e.g., anchoring effect: naming a number can affect what people expect, E.g., if you ask one group “Did Ghandi die before or after the age of 5?” and a second group “”Did Ghandi die before or after the age of 140?”, and then you ask people to guess what age he actually died, the second group will guess higher than the first group. This happens even though by 5 and 140 are obviously wrong – but they “anchor” a person’s thoughts to be closer to that first number they heard. In a session on evaluation standards, there was some good discussion on balancing the benefits of professionalizing evaluation (e.g., helps provide some level of confidence in evaluation if we have standards to adhere to and helps prevent someone who really doesn’t know what they are doing from going around claiming to do evaluation and making a bad name for the field when they do poor work) with the disadvantages (e.g., it can be elitist by keeping out people who have valuable things to contribute to evaluation but don’t have the “right” education or experience; can stifle innovation; can lead to evaluators working to meet the needs of peer reviewers rather than the needs of the client). There was also discussion about how commissioners of evaluation can lead to some issues with the quality of an evaluation by their determinations of scope, schedule, and/or budget). 1960s: with the “Great Society” in the US, there was more government intervention to meet the needs of the people and the government wanted to know if their interventions worked/was their money being spent wisely (accountability purpose of evaluation). 1967 – academics had become interested in evaluation. Theory of Evaluation as being a judgement of merit/worth. Michael Scriven (an Australian) contributed the notion of “valuing”, which isn’t necessarily part of other social sciences. Throughout the conference, a number of speakers shared different tips and tools that might be useful in evaluation. Groups asked to make up a story using their cards. Each group tells their story to the whole crowd. Did you fit the cards to a narrative you wanted? Did the story emerge from the cards? When you are evaluating, the program is the story. You want to understand how the story came to be. What was the process? What perspectives are reflected? Bonus idea: You could use this postcard activity as a data collection tool – ask people to write the anticipated story before you start, then again midway through, then at the end. Which of the things you expected held? Which didn’t? Why did things change? What was surprising? e.g., create a persona of Max the Manager, Freda the front-line staff, Clarence the Client, etc. – what are their needs/wants/constraints/etc.? how can these characters help inform your planning? John Owen’s Book: Program Evaluation: Forms and Approaches is considered a seminal evaluation text in Australia. I haven’t read it yet, so I should really check it out! Peunte & Bender (2015) – Mindful Evaluation: Cultivating our ability to be reflexive and self-aware. Journal of Multidisciplinary Evaluation. Full-text available online. Mayne (2010). Building an evaluative culture: the key to effective evaluation and results management. The Canadian Journal of Program Evaluation. 24(2):1–30. Full-text available online. Snow, M.E, Snow, N.L. (2016). Interactive logic models: Using design and technology to explore the effects of dynamic situations on program logic (presentation). Snow, M.E, Cheng, J., Somlai-Maharjan, M. (2016). Navigating diverse and changing landscapes: Planning an evaluation of a clinical transformation and health information system implementation (poster). Workshop: Connecting Systems Thinking to Evaluation Practice by Jan Noga. Sept 18, 2016. Causal Loop Diagram is from Wikipedia. The other images are ones I created, adapting from slides I saw at the conference, or photos that I took. 1. ↑ E.g., while Owen used “adoption” to refer to the “adoption” (or choosing) of a program to implement, I’ve seen others use “adoption” to refer to individuals (e.g., to what extend individuals “adopt” (or enact) the part of their program they are intended to enact). One week from today, I’ll be on the opposite side of Canada, attending the Canadian Evaluation Society’s 2016 conference. I’m doing presenting in two sessions at the conference: one pre-conference workshop and one conference presentation. Logic models are commonly used by evaluators to illustrate relationships among a program’s inputs, activities, outputs, and outcomes. They are useful in helping intended users develop programs, communicate a program’s theory of change, and design evaluations. However, a static logic model often does not allow us to convey the complexity of the interrelationships or explore the potential effects of altering components of the model. In this workshop, we will explore and create interactive logic models that will allow you to more easily demonstrate the logic within a complex model and to explore visually the implications of changes within the model. 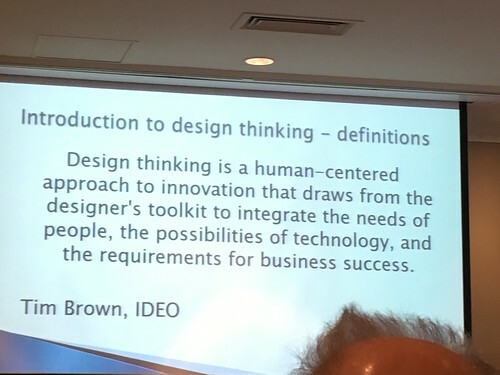 In addition, participants will be introduced to information design principles that can make their logic models – even complex ones – easier for intended users to understand and use. Bring a logic model of your own that you would like to work on or work with one of ours to get some hands on practice at accelerating your logic model. The Clinical & Systems Transformation (CST) project aims to transform healthcare in Vancouver by standardizing clinical practice and creating a shared clinical information system across 3 health organizations. Ultimately, the system will be used by 40000 users at 40 hospitals, residential care homes, etc. 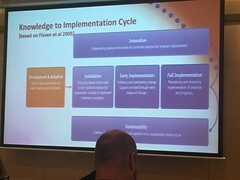 The project includes an evaluation team tasked with answering the question “Once implemented, does CST achieve what it set out to achieve?” By being engaged early in the project, the evaluation team has been able to use evaluative thinking and evaluation tools to influence non-evaluators to advance the project, long before “the evaluation” itself is implemented. This presentation will explore the ways in which the early work of the evaluation team has influenced the development of the project — including facilitating leadership to articulate goals and helping the project use those goals to guide decisions — at the levels of individuals, project subteams, and the project as a whole. There’s still time to register if you are interested! 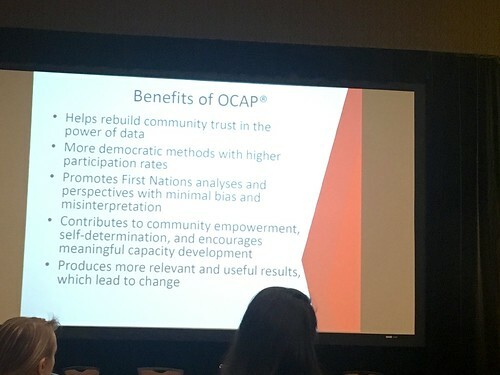 I had the good fortune of being able to the attend the 35th annual conference of the Canadian Evaluation Society that was held at the Ottawa Convention Centre from June 16-18, 2014. I’d only been to one CES conference previously, when it was held in Victoria, BC in 2010, and I was excited to be able to attend this one as I really enjoyed the Victoria conference, both for the things I learned and for connections I was able to make. This year’s conference proved to be just as fruitful and enjoyable as the Victoria one and I hope that I’ll be able to attend this conference more regularly in the future. Disappointingly, the conference did not have wifi in the conference rooms, which made the idea of lugging my laptop around with me less than appealing (I’d been intending to tweet and possibly live blog some sessions, but without wifi, my only option would have been my phone and it’s just not that easy to type that much on my phone). So I ended up taking my notes the old fashioned way – in my little red notebook – and will just be posting highlights and post conference reflections here 1Which, in truth, is probably better for any blog readers than the giant detailed notes that would have ended up here otherwise!. 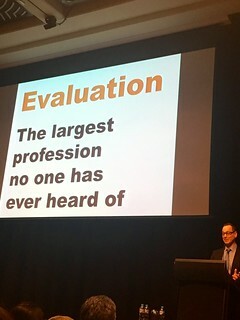 The professionalization of evaluation. The Canadian Evaluation Society has a keen interest in promoting evaluation as a profession and has created a professional designation called the “Credentialed Evaluator” which allows individuals with a minimum of two years of full-time work in evaluation and at least a Master’s degree, to complete a rigorous process of self-reflection and documentation to demonstrate that they meet the competencies necessary to be an evaluator. Upon doing so, one is entitled to put the letters “CE” after their name. Having this designation distinguishes you as qualified to do the work of evaluation – as otherwise, anyone can call themselves an evaluator – and so it can help employers and agencies wishing to hire evaluators to identify competent individuals. I am proud to say that I hold this designation – one of only ~250 people in the world at this point. At the conference there was much talk about the profession of evaluation – in terms of CES’s pride that they created the first – and practically only 2Apparently there is a very small program for evaluation credentialing in Japan, but it’s much smaller than the Canadian one. – of this type of designation in the world, as well as distinguishing between research and evaluation 3Which is a very hot topic that leads to many debates, which I’ve experienced both at this conference and elsewhere..
Evidence-based decision making as opposed to opinion-based policy making or “we’ve always done it this way” decision making 4Or, as a cynical colleague of mine once remarked she was involved in: decision-based evidence making.. This brought up topics such as: the nature of knowledge, what constitutes “good” or “appropriate” evidence, the fallacy of the hierarchy of evidence 5Briefly, there is a hierarchy of evidence pyramid that is often inappropriately cited as being an absolute – that higher levels of the hierarchy are absolutely and in all cases better than lower levels – as opposed to the idea that the “best” evidence depends on the question being asked, not to mention the quality of the specific studies (e.g., a poorly done RCT is not the same as a properly done RCT). 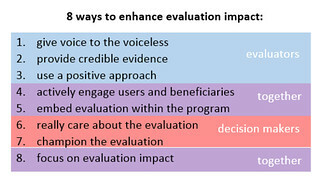 I’ve also had this debate more than once..
Supply side and demand side of evaluation.The consensus I saw was that Canada is pretty good at the supply side – evaluators and providing professional development for them – but could stand to do more work on the demand side – getting more decision makers to understand the importance of evaluations and the evidence they can provide to improve decision making. “Accountability vs. Learning” vs. “Accountability for Learning”. 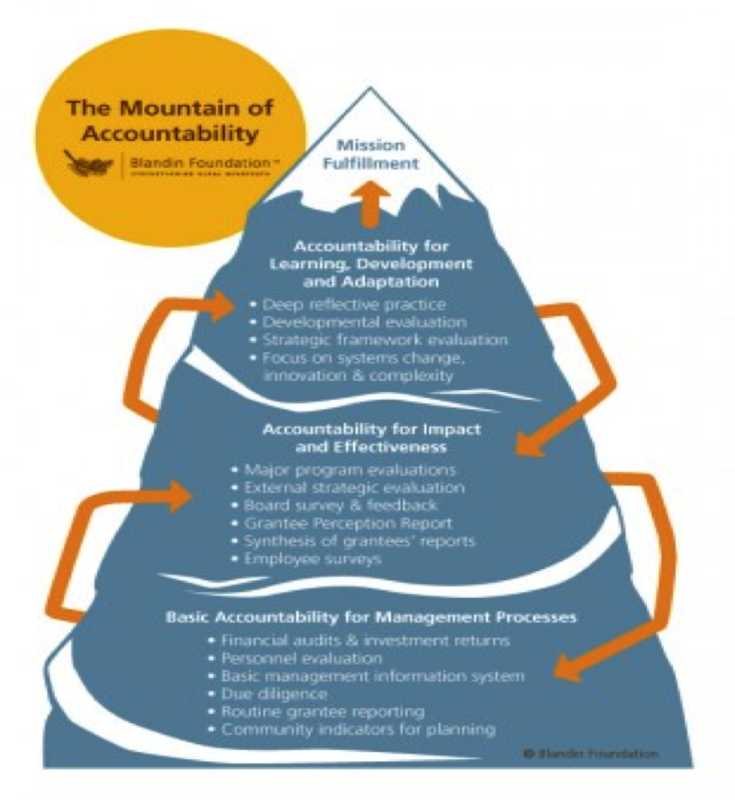 One of the purposes for evaluation is accountability – to demonstrate to funders/decision makers/the public that a program is doing what it is intended to do. Another purpose is to learn about the program, with the goal of, for example, improving the program. But some of the speakers at the conference talked about re-framing this to be about programs being “accountable for learning”. A program manager should be accountable for noticing when things aren’t working and for doing something about it. One of the sessions that particularly resonated for me was “Evaluating Integration: An Innovative Approach to Complex Program Change.” This session discussed the Integrated Care for Complex Patients (ICCP) program – an initiative focused on integrating healthcare services provided by multiple healthcare provider types across multiple organizations, focused on providing seamless care to those with complex care needs. The project was remarkably similar to one that I worked on – with remarkably similar findings. Watching this session inspired me to get writing, as I think my project is worth publishing. Community Report Cards: a collaborative way for communities to assess themselves 6The presentation from the conference isn’t currently available online – some, but not all presenters, submitted their slide decks to the conference organizers for posting online – but here’s a link to the general idea of community report cards. The presentation I saw focused on building report cards in collaboration with the community.. The Fire Tool: a culturally grounded tool for remote Aboriginal communities in Australia to assess and identify their communities’ strengths, weaknesses, services and policies. 7Again, the presentation slide deck isn’t online, but I found this link to another conference presentation by the same group which describes the “fire tool”, in case anyone is interested in checking it out.. Facilitated Written Survey: Options are read aloud, respondents provide their answer on an answer sheet that has either very simple words (e.g., Yes, No) or pictures (e.g., frowny face, neutral face, smiley face) on it that they can circle or mark a dot beside. You may have to teach the respondents what the simple words or pictures mean (e.g., in another culture, a smiley face may be meaningless). Pocket Chart Voting: Options are illustrated (ideally photos) and pockets are provided to allow each person to put their vote into the pocket (so it’s anonymous). If you want to disaggregate the votes by, say, demographics, you can give different coloured voting papers to people from different groups. 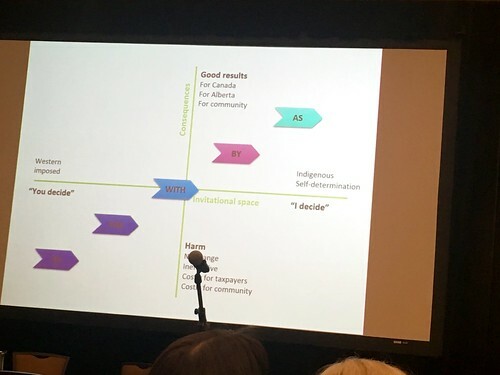 Logic Model That Allows You To Dig Into the Arrows: the presenters didn’t actually call it that, but since they didn’t give it a name, I’m using that for now. In passing, some presenters from the MasterCard Foundation noted that they create logic models where each of the arrows – which represent the “if, then” logic in logic model is clickable and when you click it, it takes you to a page summarizing the evidence that supports the logic for that link. It’s a huge pet peeve for me that so many people create lists of activities, outputs, and outcomes with no links whatsoever between then and call that a logic model – you can’t have a logic model without any logic represented in it, imho. One where you actually summarize the evidence for the link would certainly hammer home the importance of the logic needing to be there. Plus it would be a good way to test out if you are just making assumptions as you create your logic model, or if there is good evidence on which to base those links. Research Ethics Boards (REB) and Developmental Evaluation (DE). One group noted that when they submitted a research ethics application for a developmental evaluation project, they addressed the challenge that REB’s generally want a list of focus group/interview/survey questions upfront, but DE is emergent. To do this, they created a proposal with a very detailed explanation of what DE is and why it is important, and then creating very detailed hypothetical scenarios and how they would shape the questions in those scenarios (e.g., if participants in the initial focus groups brought up X, we would then ask questions like Y and Z). This allowed the reviewers to have a sense of what DE could look like and how the evaluators would do things. Reporting Cube.Print out key findings on a card stock cube, which you can put on decision makers desk. A bit of an attention getting way of disseminating your findings! Social Return on Investment (SROI) is about considering not just the cost of a program (or the cost savings you can generate), but to focus on the value created by it – including social, environmental, and economic. It seemed very similar to Cost-Benefit Analysis (CBA) to me, so I need to go learn more about this! Rapid Impact Evaluation: I need to read more about this, as the presentation provided an overview of the process, which involves expert and technical groups providing estimates of the probability and magnitude of effects, but I didn’t feel like I really got enough out of the presentation to see how this was more than just people’s opinions about what might happen. There was talk about the method having high reliability and validity, but I didn’t feel I had enough information about the process to see how they were calculating that. In addition to asking “are we doing the program well?”, we should also ask “are we doing the right thing?” Relevance is a question that the Treasury Board seems to focus on, but I think I haven’t given it much thought. Something to consider more explicitly in future evaluations. 1. ↑ Which, in truth, is probably better for any blog readers than the giant detailed notes that would have ended up here otherwise! 2. ↑ Apparently there is a very small program for evaluation credentialing in Japan, but it’s much smaller than the Canadian one. 3. ↑ Which is a very hot topic that leads to many debates, which I’ve experienced both at this conference and elsewhere. 4. ↑ Or, as a cynical colleague of mine once remarked she was involved in: decision-based evidence making. 5. ↑ Briefly, there is a hierarchy of evidence pyramid that is often inappropriately cited as being an absolute – that higher levels of the hierarchy are absolutely and in all cases better than lower levels – as opposed to the idea that the “best” evidence depends on the question being asked, not to mention the quality of the specific studies (e.g., a poorly done RCT is not the same as a properly done RCT). I’ve also had this debate more than once. 6. ↑ The presentation from the conference isn’t currently available online – some, but not all presenters, submitted their slide decks to the conference organizers for posting online – but here’s a link to the general idea of community report cards. The presentation I saw focused on building report cards in collaboration with the community. 7. ↑ Again, the presentation slide deck isn’t online, but I found this link to another conference presentation by the same group which describes the “fire tool”, in case anyone is interested in checking it out.